Amazon is Offering 100% Cashback Upto Rs.300 For Your 1st Ever Pantry Order From Amazon India. With this offer You Can Grab Any Grocery Or Pantry Products For Free Worth Rs.300. 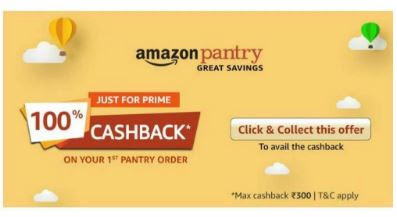 How To Get Products Worth Rs.300 For Free From Amazon Pantry? Complete transaction and the cashback will be credited in the form of Amazon Pay balance within 72 hours after the items are dispatched.